Fernand Lust is not listed in any of the typical sources for makers names, nor does his name trigger a response through internet searches. Pity, in that this is clearly a very high-quality mechanism, made by a gifted and inventive maker. From the notations on the dial I conclude that Fernand was either professor or a student at a professional (Prof. elle translates to “professionnelle”, referring to a school focused on getting a job, as opposed to the more abstract studies possible at a university) or technical school in Brussels, Belgium, which focused on mechanical and electrical engineering, with a specialty in the study of precision time keeping. Based on the quality of his work, and the meticulous attention to detail, and unusual way he approached making his clock more efficient and practical, I can only conclude he was very good if he was a professor, or exceedingly gifted if he was a student. The single detail that most stands out, for me, is the weight pulley. As you can see in the photo’s, Fernand didn’t just take a piece of brass and bend it to make the pulley bail (the part that the weight hangs from, and in which the pulley rotates). 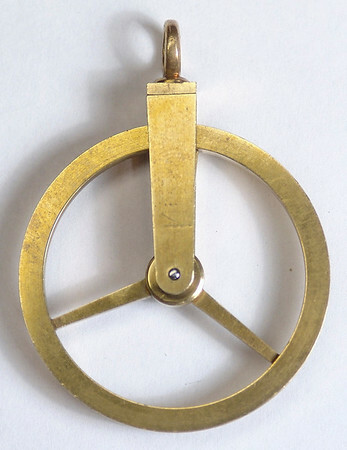 Instead, he made a pair of matching brass angle pieces that fit together perfectly, between which the pulley rotated. The two angle pieces are held together by a perfect little eye-hook. It is this weight hook that I feel truly reflects the quality and the attention to detail that personifies this clock. That little hook is all of a quarter of an inch across, and absolutely perfectly made. Next note the pendulum. The bob, of very heavy, very solid construction, and is filled with mercury to provide accurate temperature compensation. The bob is sealed to preclude loss of mercury, and is threaded onto the pendulum rod. It turns very smoothly, and is designed to include a scale to the top of the bob which allows you to monitor the amount you adjust the pendulum length. And, just above the pendulum there is a small pin mounted to the pendulum rod on which are hung small washers to provide the final, precision rate regulation. The pendulum weighs 14 pounds, while the drive weight weighs only 8 pounds. Oh, speaking of unusual - the weight cord doesn’t just hook onto a hook or a stud on the bottom of the mechanism. No, Fernand made a small pulley that rides on a steel rod between the bottom of the two mechanism plates (the photo shows the pulley side, with the bail on the other side of the rod). The bar even has a built-in stop to keep the pulley from rolling to the wrong end of the rod. All this effort just to assure that the weight hangs with as little drag as possible on the winding drum. As one would expect in a precision regulator, the mechanism mount is extremely thick and heavy, the mechanism plates just over 4 mm (1/6 of an inch) thick, the pillars massive, the pinions larger than found in your typical clock (to make the transfer of power from the gears to the pinions as efficient as possible - a feature typically only found in precision regulators). And, to add to the special features this mechanism has a single piece anchor (as found in Austrian-made Vienna Regulators - a much more elegant, and precise design than found in German-made Viennas), maintaining power, a center-sweep second hand, and the plates, the dial pan, and the mechanism mount are all finished with an ‘engine turned’ pattern. The case is made from quarter-sawn oak, showing extensive medullary rays typical for wood cut in this manner. For those that don’t recognize the term, Medullary rays are the tree’s nutrient “transport lines”, extending from the air pores in the bark to the center, or core of the tree. They are the often wavy patterns one sees in quarter-sawn oak that usually run nearly perpendicular to the grain of the wood. The advantage of quarter-sawn lumber is its enhanced stability - it does not warp, twist or shrink and expand as much as lumber that is cut in a more conventional manner. And, the medullary rays add a beautiful counterpoint to the very plain grain of typical oak. Note too the very unusual lock escution, reflective of a leaf, and executed in solid, rather thick brass. While this may seem quite unusual, I believe it reflects the time, the Art Nouveau period in Europe, with its natural themes, and free-flowing designs. I suspect this escution reflects the ‘avant garde’ attitude of students and professors in Brussels during the first years of the twentieth century. What better way to show your independence than to include a whimsical escution on an otherwise extremely mechanistic clock? This clock is in excellent condition and runs well. The key-lock door works, and comes with an appropriate, old key. This is one of the most interesting and special pieces offered on this site.